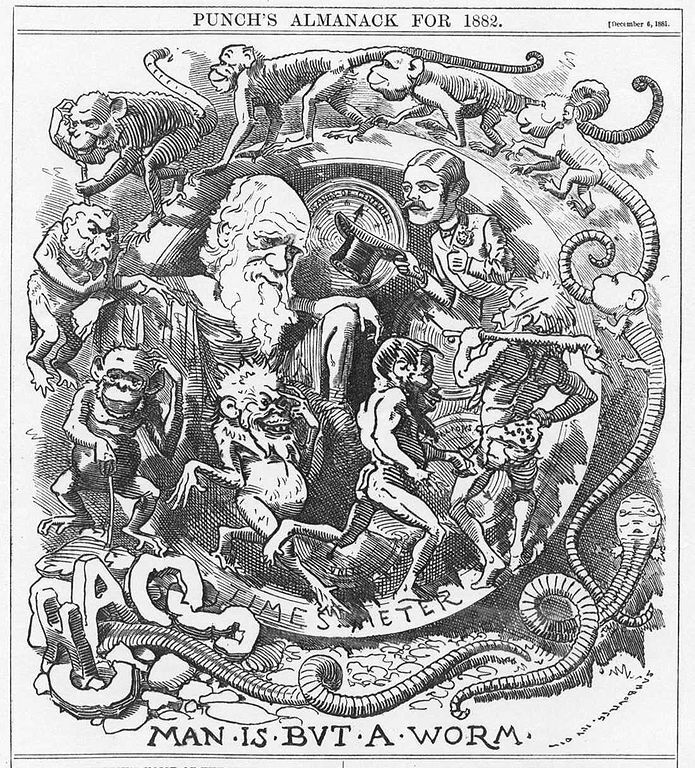 “Caricature of Darwin’s theory in the Punch almanac for 1882, published at the end of 1881 when Charles Darwin had recently published his last book, The Formation of Vegetable Mould Through the Action of Worms.–Via Wikipedia. “This preservation of favourable individual differences and variations, and the destruction of those which are injurious, I have called Natural Selection, or the Survival of the Fittest. Variations neither useful nor injurious would not be affected by natural selection, and would be left either a fluctuating element, as perhaps we see in certain polymorphic species, or would ultimately become fixed, owing to the nature of the organisms and the nature of the conditions. This entry was tagged Chapter 15: Evolution, Chapter 23: Evolution. Bookmark the permalink. ← The Voyagers (Penny Lane, 2010) — Science Club Blog Post I.
I know how it feels to hear people misuse or misunderstand words used in science. Sometimes they are taken literally, like the example of “natural selection” presented in this post. Other times, words are misinterpreted and loose their real scientific meaning. This may be due to lack of education; yet most of the time it’s just a result of ignorance. For example, probably the most misused scientific word has to be “theory.” Many people use it to point out an idea thought of at the moment, saying, “It’s just a theory.” But, as we know, a theory isn’t an just an idea; it’s a hypothesis that has been proven many times by various experiments. “Hypothesis” is another misused word; people use it to point out what they think could be “an educated guess,” not knowing that a hypothesis is an explanation that has been created through observation and can be tested. Great link, Arnaldo. livescience.com is a great source for scientific news. It is truly sad to think that because of ignorance or simply lack of interest, people tend to misunderstand Darwin’s theory of Natural Selection, which in fact is quite simple: Natural selection describes the way species adapt to their environment, making them more able to survive, reproduce, and evolve as the environment changes. I sincerely hope that as time progresses people will become more conscious about the mistake they make when misinterpreting this theory and will start to treat it with the seriousness it deserves. I’ve used the Berkeley guide myself. I agree with what you’ve said regarding Natural Selection. But keep in mind that the way people think is a very important part of who they are. The term ‘ideology’ begins to explain many of the reasons behind not accepting theories that explain the way nature works. It also has a lot to do with education, or lack there of. That’s the mark of a competent scientist: ask the right questions. Charles Darwin is called the father of genetics for a reason. He did more experiments with greater outcomes than a lot of scientist in during time. He predicted genes without even knowing it and there is even a whole branch (genetics) resulting from all of his discoveries in modern science. In my opinion, it is ok if his definition of natural selection is misused by people. What I think is unacceptable, is how ignorant people can be towards his discoveries. He had the proves to back up his definition and discoveries about natural selection, there was no reason for people to not accepted it during his time. It is sad to see that even in the modern era, scientist are suffering like Darwin within the scientific community because their discoveries are not being well appreciated. I think that there are scientist that have found the cure for many incurable diseases, but have been rejected by the scientific community. When a few hundred years have passed from today, many of today’s scientist will be recognised for their discoveries just like Darwin. Darwin had to face great opposition from those with too narrow minds who were not willing to accept his controversial statements. In his book, The Origin of Species, he dedicates a chapter called Difficulties on Theory which exactly presents that. The difficulties that the public may have with his theory of descent with modification and his explanations. Charles Darwin addresses “Transitions. Absence or rarity of transitional varieties. Transitions in habits of life. Diversified habits in the same species. Species with habits widely different from those of their allies. Organs of extreme perfection. Means of transition. Cases of difficulty. Natura non facit saltum. Organs of small importance. Organs not in all cases absolutely perfect. The law of Unity of Type and of the Conditions of Existence embraced by the theory of Natural Selection” as said difficulties. He knew that people were going to be skeptic and was aware that he had to make his findings portrayed in a way that the public could understand. The Guttenberg Project is a great way to find classics, completely free. I suggest that you read The Origin of Species. Its a great read. And we need more people interested in Biology that have actually read on of the most important books ever written. This may go beyond Darwin’s theory of evolution, but I believe that this Biology course branches out from the conventional book lessons. As we had spoken before, there is a great debate occurring, especially in our system which derives from the United States’ education system, of whether the origin of Earth should be viewed from a evolutionist or creationist point of view. An high number of people, about 47% of the United State’s population, believe that the Earth is about six thousand years old and that no animals derived from a common ancestor. There is even a creationist museum located in Kentucky, which features the tree of knowledge and children playing with dinosaurs. Evolutionist theories became more famous in the 1960’s, and yet there is still a great amount of doubt. No definite side should be chosen, for science is merely man’s perspective of what occurs in the world, while creationism is what a book written by man claims. As scientists however, we should keep our minds open to new ways of thinking. A proper discussion of the issues stated in your comment, Ariana, would require a whole semester of a course on the philosophy of science. But I’m glad the post has motivated your interest on this subject. I think that Charles Darwin’s theory really makes sense. Since he observed how organisms react to the environment and adapt it makes sense and I agree with his explanation. But this has brought many controversies because everyone has different point of view of evolution. I was reading about his theory and found this link that helped me understand more his process and was able to agree with him completely. Both Darwin and Wallace failed to understand an important aspect of natural selection. They realized that plant and animal populations are composed of individuals that vary from each other in physical form. They also understood that nature selects from the existing varieties those traits that are most suited to their environment. If natural selection were the only process occurring, each generation should have less variation until all members of a population are essentially identical, or clones of each other. That does not happen. Each new generation has new variations. Darwin was aware of this fact, but he did not understand what caused the variation. The first person to begin to grasp why this happens was an obscure Central European monk named Gregor Mendel click this icon to hear the name pronounced. Through plant breeding experiments carried out between 1856 and 1863, he discovered that there is a recombination of parental traits in offspring. Sadly, Darwin and most other 19th century biologists never knew of Mendel and his research. It was not until the beginning of the 20th century that Mendel’s pioneer research into genetic inheritance was rediscovered. This was long after his death. He never received the public acclaim that was eventually showered on Darwin during his lifetime. Although this image was not drawn by charles darwin, it is pretty accurate since it starts with the eukaryotic cell. Something really worrisome about society is our inability to tolerate views that our not our own, and then trying to impose our views upon others. I found an article that talked about a South Carolina state senator who wants to block the inclusion of natural selection in state schools. The article states that a committee had already approved this change, but fortunately there seems to be a subcommittee going back in to look into the subject. What’s most shocking about the article is a chart that shows different countries’ rate of acceptance of evolution, and seeing that the Unite States is second to last, with more than half the people believing evolution to be false. My biggest problem with this news is not the ignorance some people live in, it’s the imposition of their views on younger generations, instead of teaching different theories and letting them choose for themselves what they want to believe in. Something that pleasantly surprised me though was the number of people that DO believe in evolution in different countries, I never realized how many countries were more accepting of evolution compared to the U.S. Recent studies revealed that 1 in 4 Americans believe that the Sun orbits Earth. This means that the current state of scientific literacy in USA is alarmingly poor. And politicians such as the SC senator are not helping. Charles Darwin made countless work about natural selection. Natural selection is the process whereby organisms better adapted to their environments tend to survive and produce more offspring. In the link below, I searched for Charles Darwin’s work and its contributions to science. It mentions his five theories over evolution, how does natural selection works, and many other things. FACT: Darwin’s five theories where; evolution, common descent, species multiply, gradualism, and natural selection. Natural selection was his most famous, it states that evolutionary change comes through the production of variation in each variation and differential survival of individuals. Natural selection is very simple but people misunderstand it. Natural selection is as simple as having organisms survive in a specific environment and hope they adapt fast enough so they can keep their species present. In this instant we are all the product of the successful process of natural selection and evolution. The mutation of genes is also a big part in evolution and natural selection. This video is awesome. Funny and well done. Great find, Giancarlo. It js very dissapointing to think that many scientist, which should all help each other seeing as they all have the same goal: to explain the still unexplainable, are ignorant and refuse to accept a theory because it’s not what they believe. They should take it into consideration, prove it themselves and if it doesn’t work out then they can reject it, but it is very sad that due to ignorance they wouldn’t accept a fellow scientists hard work. A very important trait for any scientist, thinker, artist, etc. : courage. There is many controversy when it comes to evolution even after many years from Darwins theory. Many religious leaders denounce this theory and say that there is a higher being which created things and changed them. When it comes to teaching this it took many years and is still a bit contoversal that it should be taught in school mostly in catholic schools but scientist see no controversy they believe that evolution is well supported by many changes in various species which comes down to natural selection and leading to the diversity and evoluted life seen today. Natural selection may seem as something imposible and hard to believe to many but how else can it be explained with facts and not with spiritual thoughts? Here is a video that explains natural selection in an easy way for those that still have doubts. Charles Darwin was an excellent scientist. It is sad that some people don’t understand what he has done. There are many misconceptions surrounding the theory of evolution and natural selection. Some people think that humans can’t really damage an ecosystem, because the animals will adapt to the changes. Other people think natural selection produces organisms that are perfectly adapted to their environments. And, people even think that natural selection gives organisms what they need, when what it actually does is that it helps the individuals that have survived a challenge because of a genetical variation reproduce, which will cause their species to evolve. Natural Selection for me is the most important thing for us today. It is what gives rises to different species of animals on Earth. If not for the variation in organ in’s genes then no other species would be created and when the environment changed the original species would die. Natural Selection is an on going process ins chi animals will keep dying and the “chosen” will survive and reproduce offspring that have a higher probability than its previos generation to survive. Natural Selection is the way species are created in our universe and if not for it then the world, the universe, EVERYTHING would a barran place since nothing would be able to exist in our changing environment. Natural selection is such a large part in the Theory of evolution,because it shows the progression that a species has made through the passing of genetics making it more fit to live in a certain environment, weather that has to do with because shape, beak size, camouflage abilities, etc. if you take two different species you will find that the derived from some kind of common ancestor but due to their differences of environments they have to adapt to survive or they would go extinct. Natural selection and evolution only makes sense because if was no evolution there would be know change so we has human beings may have never developed advanced language or even technology because if there is no evolution there is no way for a species to evolve, and if a species can’t evolve it dies off because it never gets any better. I personally think Darwin’s theory of Natural Selection makes sense and I don’t understand why so many people have misconceptions regarding his theory. Natural Selection is when a species adapts to its environment in order to be able to survive and maintain the species alive. This helps the species evolve successfully and change for the better, improving in many ways so it can keep up with its constantly changing environment. It has occurred that people oppose to a new way of thinking because they are not open about new ideas. It depends on the type of person, of course, both open and close minded. But when you are taught something and someone objectifies it, you will usually continue believing on what you have been taught since the beginning. Other times, ideas are just simply misinterpreted by the reader or listener. It can be ignorance or just that the receiver lacks education or information on the topic. There are many scientific terms that have been misinterpreted over time, such as the creation of the world and the Theory of Evolution. It is usually objected by people who have a strong belief on an idea, or in many cases, religious people. Although these theories show proof and have been experimented on and investigated for years, some people will still objectify the idea. Nearly one-third of Americans today still do not believe in the Theory of Evolution (source: http://m.livescience.com/42251-politics-evolution-belief.html). It’s a shame individuals still cannot understand natural selection after about 150 years, even though the concept is quite simple. Through time, certain inheritable traits facilitate an individual’s ability to thrive and multiply, therefore an population’s genetic makeup can be altered eventually. Sometimes, after many, many years, an organisms genes can become so different that they end up being a completely different species than what their ancestors were. This video does a better job at explaining natural selection and Darwin’s observations than I do, and I highly recommend it.